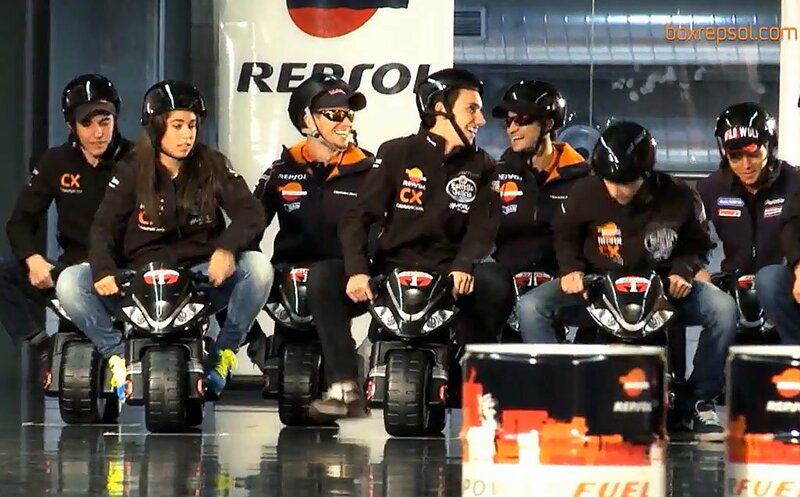 Spanish oil company and noted motorcycle racing sponsor Repsol recently gathered its cadre of riders from MotoGP, Moto2, Moto3 and the Spanish CEV championship for a special race – on electric minimotos. 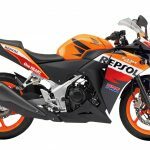 Honda MotoGP riders Casey Stoner and Dani Pedrosa were joined by Moto2 racer Marc Marquez, his brother Alex Marquez and his fellow Moto3 racers Miguel Oliveira and Alex Rins and CEV racer Maria Herrera in the minimoto race. Hijinks ensued as racers grappled for position in the low-speed race. All eight riders seemed to have fun, especially Marc Marquez. The 19-year-old phenom is on the verge of capturing the 2012 Moto2 World Championship and is due to replace Stoner on the Repsol Honda team next season, and Marquez showed his competitive nature with full tuck on his bike. 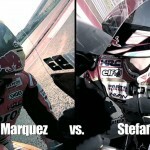 He even hit the ground a couple of times, first while mounting the minimoto and later after taking the lead from Herrera. 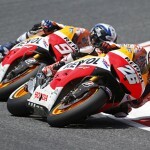 As for the winner, it was a close finish but it looks like Pedrosa with his hand grabbing the tape on the finish line. With the way he’s been riding of late, winning four of the last five MotoGP rounds, that’s probably not much of a surprise.